"Dance, dance, or we are lost." Pina Bausch's final words summarize her life and provide the inspiration for acclaimed director Wim Wenders' ("Wings of Desire," "Buena Vista Social Club") breathtaking tribute to the legendary choreographer. Bausch and her Tanztheater Wuppertal elevated dance into brilliantly subversive new expressive realms, and in this exhilarating film Wenders captures the raw, heart-stopping intensity of the movement and in stunning 3D transforms it into a transcendent cinematic experience. 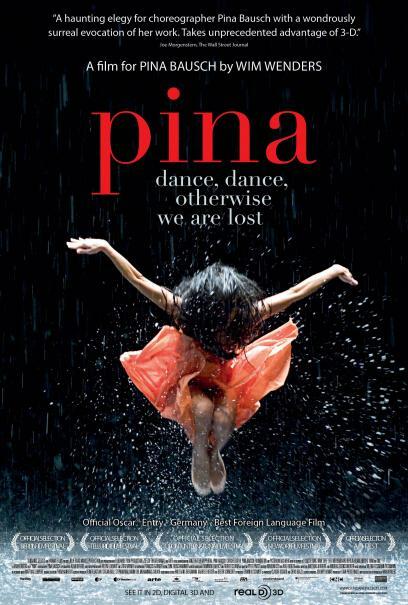 An official selection of the Berlinale, Telluride, Toronto and New York film festivals, and now Germany's official entry for the Oscar for Best Foreign Language Film, "Pina" features interviews with and performances by Bausch's beloved original company members, and offers an indelible image of an artist who went the full distance in her uncommonly rich creative life.